Did anyone enjoy watching the tennis at Wimbledon? Or perhaps lucky enough to visit soaking up the sun and amazing atmosphere. We were delighted to galvanize two sculptures by Jenny Pickford for the All England Lawn Tennis & Croquet Club in Wimbledon, as you can see they look beautiful in the gardens. Jenny is a contemporary artist blacksmith designing and making unique sculptures, water features and architectural ironwork from her forge in rural Herefordshire. Click here to visit her website. 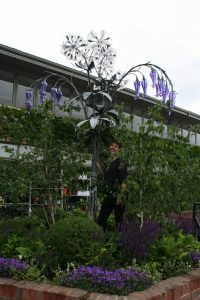 The allium was placed at the front of the clubhouse standing proudly 3 metres high, galvanized mild steel, has 30 pieces of blown glass flowers and takes approximately 6 weeks to make. There are a number of bespoke sculptures around the Grounds, the latest addition of which is the Alchemilla Sculpture at the top of St Mary’s Walk. This sculpture was created by internationally renowned sculptor William Pye, and was unveiled by HRH The Duke of Kent at The Championships 2016. We have been galvanizing Jenny’s work for a number of years, treating it with the respect that it deserves. You can view her public art commissions in China, Australia, the USA and across Europe. The wildflowers sculpture is 3.5 metres high.